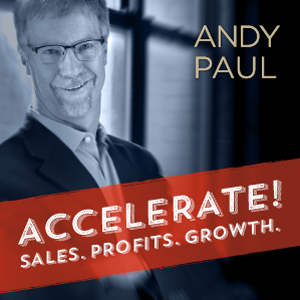 I’m excited to announce the launch today of my new podcast: Accelerate! (Sales, Profits, Growth). Starting today, Accelerate! will be your go-to resource for the latest insights from the leading authorities in sales, marketing, sales automation, leadership, coaching, market research, personal development and other fields to help you accelerate the growth of your sales, your business and, most importantly, you. Four days a week I’ll engage in unscripted conversations with top experts who will share their personal stories, keen insights and proven advice, to educate, inspire and motivate you to reach the next level in whatever you do. I want to challenge your status quo. I want to free you up to think differently about the things that you’ve done a hundred times before. And, then, do them differently today. Because, the “Growth” in the title of this podcast is not just about your sales or your business. It’s also about you. To accelerate your success in sales, or the growth of your company, requires that you grow your own capabilities. My guests will help you achieve that in more ways than one. I’m celebrating launch day by releasing 10 episodes with some of my favorite guests. Check out these great experts below. To download or listen to all of these episodes, start by clicking on the individual episode links below. If you like what you hear, please be sure to subscribe to Accelerate! on iTunes. Post a review. And sociably share these episodes with your friends and colleagues! Mike is the author of the best-selling sales book “New Sales. Simplified.” Sellers love his book because Mike shares an extremely powerful message about growing a business through proactive prospecting using simple, effective techniques that any sales rep or sales manager can deploy. Mike is also one the most generous people I know in this business and he shares his brand of sales wisdom with you on this episode. Download or listen to Mike here. Dan inspires me more than just about anyone I know. His brand of no excuses, stop your whining, take no prisoners, just do something advice and guidance demands a place in your day. A successful entrepreneur and record-setting ultra-marathoner, Dan knows how to get stuff done. Check out Part 1 of our recent conversation. Just open your mind and your ears and hold on. The insights and information come fast and furious in this episode. Meredith is a widely respected professional performance coach. She’s been perfecting the craft of coaching since long before it became a fashionable buzzword. She’s seen it all and if you want to learn an effective, proven framework for becoming a great coach that can help sellers transform their results, then you have to check out this episode. Keenan is A Sales Guy. He’s a blast of high-intensity energy focused on all things sales. Be sure to listen to his unique perspectives on the hustle and discipline required to consistently elevate your performance to the next level. His authenticity and enthusiasm are unmatched in the sales field. This is a don’t miss episode. Start here! Miles is one of the leading authorities on the sales automation tools and technologies that can truly drive improved sales performance. He ran high-performance sales teams for Dell during their high-growth days so there isn’t much he doesn’t know about sales. Listen here to learn why Miles is the go-to resource for the hacks and apps that can make a difference in your sales results. Jim is founder of the Sales Lead Management Association (SLMA), a podcaster (be sure to check out his show…….) and a consultant. And, he has one of the keenest minds about sales that I know. With the SLMA he has built a vibrant worldwide community of sales and marketing leaders that share best practices about lead management. In this episode we discuss why lead management has become so complex. Click here to listen to Jim talk about the strategies you should use to turn sales lead follow up into the engine of revenue growth for your business. Check it out here. Leanne is a business coach and author of Be The Red Jacket In A Sea Of Grey Suits that teaches sellers how to stand out in crowded competitive markets. She has a huge following among entrepreneurs that seek out her brand of solid, mid-western, plain-talking, common-sense sales guidance. Leanne’s not shy about expressing her point of view. You’ll want to listen to this episode. Ken is a leading sales management expert and the author of multiple books on how to build high-performance sales teams. He’s in demand with start-ups, entrepreneurs and larger enterprises to help them put the high-performance processes in place to quickly scale their sales. This is sales acceleration and I wanted to make sure I had Ken on one of my first shows because of the wealth of sales wisdom and insights he has to share. Download and listen here now. Steven is author of the best-selling book 52 Sales Management Tips. It’s a deceptively simple title for a book that has a lot of serious meat for sales managers. I don’t write glowing reviews for every sales book I read. I gladly did for Steven’s book. You’ll be glad you listened to this episode. Bob is everyone’s favorite sales person. He is an immensely respected sales expert, and the author of a great sales book, Selling Fearlessly. Don’t be fooled by his genial demeanor. When he ran his own business Bob was, by his own admission, a “sales machine.” Listen to this episode as Bob details his highly effective triad of sales success that any sales rep or entrepreneur should memorize and build on to become their own sales machine. On deck for Tuesday: Episode #11 with my guest, Anthony Iannarino. We talk about a number of urgent sales topics including how to land your dream customer.